Back in August, I wrote about cutting the cable cord. At the time, I concluded that it wouldn’t pay to cut cable, but we have since revised our opinions. (Look for those revised opinions as well as reviews on the products/services that caused us to review them in some future posts.) We’re now not just considering going without cable, but without a landline phone as well. For phone service, we would rely on our cell phones. 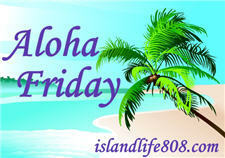 My Aloha Friday question is: Have you gotten rid of your cable/satellite TV service? Have you gotten rid of your landline? If so, how much money have you saved and do you think it was worth it? We’ve been discussing this for quite awhile too. As far as the landline goes we’d like to get a “Magic Jack” for the house because we have a 12 yr old & a 7 yr old & I think it’s important but the number would be long distance so we haven’t. We’ve been talking seriously about dropping satellite too. It would save about $80 a month & to be quite honest all of the shows that we watch are on the internet. So we haven’t yet but I think we will soon. I never had cable to begin with, but I am considering getting rid of my land line (just want to make sure that I’d be saving if I do). .-= Drahdrah´s last blog .. =-. .-= Ave @ Made In Canarias´s last blog ..Halloween digital scrapbooking kit =-. .-= East Coast Wahine´s last blog ..It’s Aloha Friday #23!! =-. We have satellite, but have never had a landline. Since we get satellite internet, we really feel like there’s no reason to have a landline. It would cost us about $50 a month just to have a landline, before any calls were made. .-= Andrea @ ChocolateFingerprints.net´s last blog ..Oh, Ziploc! (Giveaway) =-. .-= AuntieE´s last blog ..Aloha Friday -Yard Decorations =-. We have basic cable and we have vonage for our phone. I can’t see us getting rid of either in the near future. We only have our land line to get a better cell phone package. We never use it except to fax. We live in a town that really has no other option to cable and satellite so we just deal with it. No we have both but we are considering changes. .-= Pamela M. Kramer @A Renaissance Woman´s last blog ..Freebie Friday – Week 27 =-. We no longer have a landline. We just use cell phones and it’s fine. It’s saving me $35 per month. .-= Mama Dweeb´s last blog ..Aloha Friday! Silly Fear? =-. I’ve considered getting rid of cable, but since we can’t afford other sources of entertainment, we haven’t done it. If we need to though, we’ll get rid of it and just try to watch online. We don’t have a home phone; we only have cell phones and save quite a bit that way. .-= Shelly´s last blog ..Aloha Friday: Comfy Jeans =-. We have not gotten rid of cable although it would be great to not have that bill. I am seriously considering getting rid of our landline though… even if we added a cell to your plan with our home number on it, it would be cheaper than the landline. .-= Stefany´s last blog ..Aloha Friday: Blog Name =-. Cable is so overpriced but I love tv so I have to keep it. I still have the landline too. I just like the clarity and reliability. .-= blueviolet´s last blog ..Aloha Friday: Scrub a Dub Dub =-. I pay less than $8/month to have “cable”. It gives me reception, 3 PBS stations, and in all honesty I do not need it, since I watch exactly 1 1/2 hours of telly a week. .-= Jennifer´s last blog ..The Lovely Bones By Alice Sebold: A Giveaway =-. I have cable and landline still. I really want to get rid of my landline, but afraid to do so…especially if there was another natural disaster. We have kept out landline and cable so far but we’ve been talking about cutting costs when it comes to the landline! .-= Marie´s last blog ..Aloha Friday =-. .-= Becca´s last blog ..Aloha Friday #21 =-. .-= kailani´s last blog ..Dress-Up with Aeromax Toys =-.